The South Africans have won another gold. The team of Sizwe Ndlovu, Matthew Brittain, John Smith and James Thompson secured the country's third gold medal of the London Olympic Games. The rowing team won the men's lightweight four, in what was such an exciting race to watch. We have now moved up to 8th position in the medal standings, which is fantastic. Think there are still more medal hopefuls in swimming and athletics and if Chad wins gold again tonight we could move up to 5th position. Now that would be flippen impressive, you never really realise how much you love the Olympics until they are here. 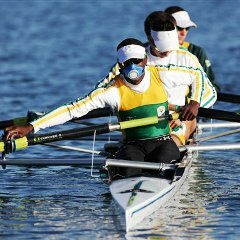 Let’s bring home more medals team SA.